Do you like to get a free freecharge voucher? It is very simple. McDonalds has partnered with Snapdeal and Freecharge to give you a free Rs.50 freecharge voucher just for voting. There are few more prizes also there. You can check it here. How to get McDonals Freecharge voucher? 1. Visit www.battleofspicy.com. You might get errors in home page and voting page like sever error, page not found error. Just try it again and again in that case. You will be definitely able to vote. I was able to vote after facing 4 different errors. 2. Scroll down to see the "Click here to vote now" button. 3. Click and login with your facebook login. Give your phone number. 4. There will be 2 burger options to choose from - McSpicy and Indi-McSpicy. Now vote for your favorite burger. 5. 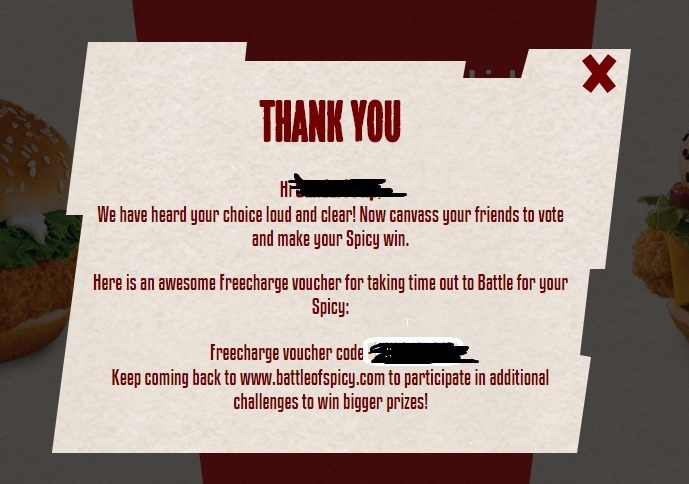 You will see a popup with the freecharge voucher code. Make a note of the freecharge voucher code. How to use freecharge voucher? 1. Visit Freecharge here. Login to freecharge if you are an existing user. Register if you are a new user. 3. Recharge your mobile number or make a bill payment for Rs.50 or more. Enter the voucher code and make payment. Currently it is working on Rs.10 recharges also. It might stop working for Rs.10 anytime. 4. You will receive the cashback worth Rs.50 within 24 hours of your recharge. 1. You can see the terms and conditions here. 2. Offer is valid till 31 December 2015.